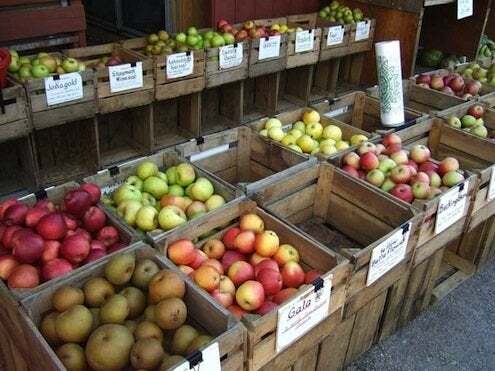 Shopping at the grocery store, one can usually find only eight or ten varieties of apples. That selection represents an infinitesimal fraction of the estimated 15,000 varieties that have been grown in North America. You’ve probably never heard of a Northern Spy, Sheepnose, or Virginia Beauty apple. At one time, these and many more types of apples were cultivated and enjoyed in their respective regions. But they gradually lost ground to more productive, visually appealing varieties that better withstood transport and storage. Today, these so-called “heirloom” apples are staging a comeback, and our taste buds are reaping the benefits. Many heirlooms have rich, sweet, and complex flavors unmatched by varieties more commonly found. The Virginia Beauty is an heirloom apple in which I have a special interest. It was grown (among other places) on the banks of Virginia’s New River, where my great-grandmother lived on a property with an orchard. 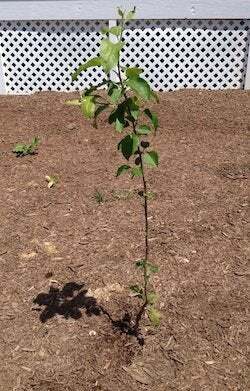 My cousin actually grafted several new Virginia Beauty trees from that orchard, and she was kind enough to give one to me recently. I was equally thrilled and terrified by her gift. How exciting: a living piece of my family history! But oh, no, I’ve never grown an apple tree before! So I’ve been doing my research. Like all fruit trees, heirloom apple trees require soil enrichment, pest control, disease management, regular thinning and annual pruning—all subjects about which you can read volumes. 1. Taste. The variety in taste and texture of heirloom apples is overwhelming. Some are delicious to eat out of hand; others are perfect for baking and cider. Many orchards offer tastings during the harvest season: Visit and you may encounter flavors you never imagined in an apple. Who knows? You could even be inspired to grow something you’ve never even heard or read about. 2. Climate. Fruit trees require a certain number of annual chill hours—hours when the temperature is between 32 and 45 degrees Fahrenheit. Each variety has a different requirement. Find out your geographic area’s chill hour averages, so you can choose the most suitable varieties for your yard. 3. Bloom Time and Pollination. Most apple varieties produce their best crops when there’s a different variety planted close by for pollination. To facilitate pollination, plant varieties that will either bloom at the same time or whose blooming will at least overlap. 4. Harvest. Every variety has a ripeness date. If you plan carefully, you can pick ripe fruit from trees all summer and fall. About a month ago, I planted my little Virginia Beauty in a bed outside our bedroom window, and it is already flourishing. With luck (and the proper care), we’ll be harvesting apples in as few as three years—the same apples my mother picked off the trees and ate at her grandmother’s house. It will be hard to wait. But I feel sure it’ll be worth it.